The Norman Booth Building was opened in 1972, following years of fundraising to replace the North Ilford Tennis Club on Beehive Lane in Ilford. The Centre was groundbreaking, as only the second state-of-the-art Sports Centre when opened over 40 years ago, the Centre has evolved through ten phases of capital development into the International multi-sports venue it is now. The Health Suite is located behind reception and is accessible from both Male and Female changing rooms, and is available for mixed access throughout the Centre’s opening times . Containing a Sauna & Steam Room, the Health Suite is the perfect place to relax and unwind after a tough day at work, or after a challenging session in the gym or on court! Develop your fitness and build your strength in our state of the art, 100-station air conditioned gym. Featuring an exciting range of Technogym cardio equipment, resistance equipment and even a free weights area, we’re constantly expanding our facilities and bettering our services. Worried about motivation? Our entertainment system provides a wide range of both T.V and music for additional energy. Feeling incredibly motivated? Perfect – we’re open bright and early from 6:30am every weekday and 8 on the weekends. As one of the premier Squash Clubs in Essex, Redbridge has a vibrant programme based across our unrivalled 7 courts, including 2 spectator-friendly glassbacks where you can showcase your talent for all to see! With the Jean Brown Indoor Arena having opened in 2012, the original 5-court badminton hall is now available for use for a variety of sporting and leisure activities. The Sports Hall is home to the extensive gymnastics programme, as well as Spartans Basketball, Tots Tennis and much, much more. Redbridge offers 8 indoor and an incredible 18 outdoor courts, with a range of 4 different surfaces to test your skills and develop your game. 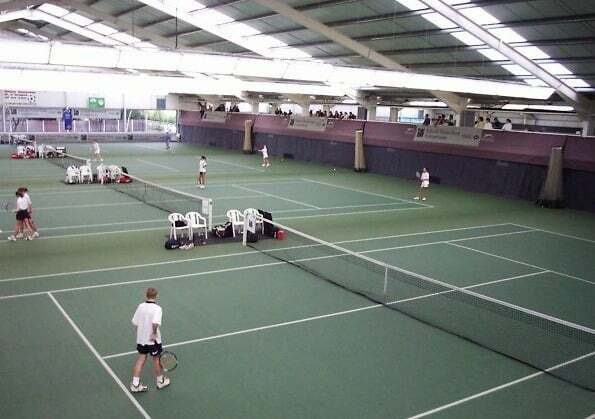 The indoor courts are part of the National Indoor Tennis Initiative, and are home to the Essex County Lawn Tennis Association and Complete Tennis Performance Academy. Our resident bar & catering team invite you to add some social time to your next visit to the Centre. With the Sports Page Bar, Coffee Shop & Bistro all located on the first floor, whether you want a healthly snack or a pint with the football on Sky TV we have the perfect surroundings.